It’s usually the beautiful smile that you notice when you first meet Kelly Cartwright. It’s only later that you realise there’s something a little different about this beauty from Geelong – she is missing one leg. The story of Kelly’s life is best described as triumph over adversity. At the tender age of 15, after being diagnosed with a rare and aggressive form of cancer in her right knee, she was forced to make a decision that would change the direction of her life. In November 2004, faced with the option of amputation or radical surgery to remove the cancer (doctors told her she would most likely still have cancer after surgery), Kelly chose amputation for her best chance of survival. After a painstaking 3 months of rehabilitation she was fitted with a prosthetic leg. Having learnt to walk again, and facing the reality that her netball career was over, she looked for a new direction. That direction was running. Sprinting with an artificial leg proved a challenge and produced many falls resulting in cuts and bruises, but with every fall came more determination, and it wasn’t long before Kelly was moving strongly, with her focus on the clock and the times she was recording. With support from her friends and family, Kelly raised enough money to purchase a new purpose-built running leg. 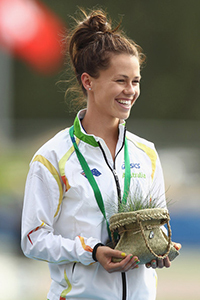 Completing her VCE at Bellarine Secondary College in 2006, Kelly had a new aim in life – to be Australia’s best above-knee amputee sprinter. Training 6-7 days a week and competing on weekends during summer, Kelly soon achieved her goal. With a growing passion for running, Kelly’s training intensified in pursuit of her latest goal – to be the best above-knee amputee 100m sprinter in the world. Adding to her fast-growing list of achievements Kelly became the first above-knee amputee woman to climb to the summit of Mt Kilimanjaro in 2009. 2013 has seen Kelly competing in the Manchester City Games and focusing on defending her World Championship crown at the IPC World Championships in Lyon, France, in July. Why use Kelly Cartwright for your next function? …exhilarated after sharing the fabulous story of a teenager who faced cancer head-on, embraced an amputation, and went on to become a Paralympic gold medallist and world track and field champion. An Australian Paralympian of the Year finalist in 2012, Cartwright is living proof that dedication, optimism and courage can turn a life around. The proud winner of Paralympic gold and silver in T42 long jump and 100m sprint events in London, Kelly also set a world sprint record and reigned as world champion in these events in 2012. Kelly's story has been credited with inspiring many, appealing to people of all walks of life in particular those with their own quest to overcome adversity. There aren’t enough adjectives in the world to describe Don but here are a few; wonderful, witty, superb, terrific, powerful, outstanding, funny, incredible, joyous and courageous. Don is a truly inspirational all-round great bloke and it was an absolute pleasure meeting him. Don was fantastic! He is entertaining, a great presenter and a very genuine happy positive person. Perfect for a motivational presentation for our Big Breakfast.